What are the Best Sunglasses for Sight Fishing? The answer to that question varies and it depends on who you ask. Everyone has their favorite brand or claims a certain lens type is superior. There are literally hundreds of different brands, frames, and lens types out there on the market. When you start searching the internet you will be overwhelmed with responses from people all over the world that use their sunglasses for all different purposes. In this review we will focus on which sunglasses are the best for sight fishing. And more specifically, which lens type works best at seeing fish in a few feet of water. Frames for sunglasses come in all different shapes and sizes. Each brand has multiple options and it’s up to you to find one that fits your face the best. The only important factor to consider, in regards to the frame shape, is the amount of light that is allowed in from the sides. The light that leaks in from the sides will reflect on the back of the lens and hinder your view. Try to find a frame that wraps around your eyes and shields light from all angles. The most important feature to consider when buying a pair of sunglasses for sight fishing is the lens type and color. When you are out looking for fish, you want sunglasses that operate well in full sun, reduce glare, and show lots of contrast between colors. A term that gets thrown around a lot in the sunglasses industry is Visible Light Transmission (VLT). It’s basically the amount of light that reaches your eye through the lenses. Measured as a percentage, VLT is affected by the color, thickness, coatings, and the material the lenses are made of. 0-19% VLT is ideal for bright, sunny conditions. 20-40% is better for overcast, low-light conditions. The higher percentage you go, the more light is allowed through the lenses. Let’s discuss five different lens types from four separate brands that come highly recommended in the fishing world. Introduced in 2013 is the Smith Optics ChromaPop product line. Normally the eye has difficulty distinguishing color where the blue/green, and the green/red, wavelengths cross over. The ChromaPop technology filters out these wavelength crossovers and delivers greater definition, color, and clarity that really make the details “pop”. With a VLT of 15% and a mirror coating that blocks 99.9% of reflected glare, the Bronze Mirror lens is a great choice for sight casting because it’s designed for full sun and provides a high contrast of colors. The red and green colors really do stand out with these glasses. It’s important to note that these lenses are not glass, so if you’re a stickler for the clarity that glass provides you may want to look elsewhere. However, these will benefit you by providing all-day comfort as a result of reducing the overall weight, and they are made from Trivex, an impact-resistant polymer, that’s widely used in the sunglass industry and is said to provide near-glass optical quality. If you really want the scratch-resistance and clarity that glass lenses provide, then the Techlite Glass lens from Smith Optics is a great option. These sunglasses have a polarchromic feature, which means that it self-adjusts its darkness dependent on the sun conditions. This means that the VLT changes from 13% to 20% depending on how bright it is. That’s perfect for overcast days where you have a mixture of full sun and passing clouds. Smith offers a few color options for this lens type, but the best choice for seeing fish is hands down the Polarchromic Copper Mirror. The copper tint combined with the anti-reflective silver flash mirror is perfect for eliminating glare and providing high color contrast. RCI Optics' slogan is simple, sunglasses designed for the elite watermen and outdoor enthusiast of the world. They specialize in advancing their lens technology that puts their competitors to task. Their newest technology is the H780 IR lenses which adds the Infared Reducing feature to their already popular H780 lenses. They claim that this will reduce eye fatigue, enhance color acuity, reduce more glare, and add color brilliance while eliminating IR distortions. They offer several lens colors options, but for sight fishing you want to go with the Copper Sunrise/Gold Mirror. You also got to love the fact that they offer many frame styles, all of which are constructed of Military Ballistics Rated Material, and are a 100% American owned Florida Company. Many of their loyal customers swear these are the best sunglasses money can buy. The HCL stands for “High Contrast Lenses”, which is exactly what you want when sight casting. The HCL Bronze lens has a VLT of 12% and utilizes PolarizedPlus2 technology that maximizes color transmission and enhances the visible color spectrum by filtering certain wavelengths. It makes the greens greener and the reds really come to life. Unfortunately these lenses do not come with a anti-reflective mirror coating, although they do claim to eliminate 99.9% of surface glare. Maui Jim boasts about using their SuperThin glass that is 20% thinner and lighter than standard glass lenses. So if you’re looking for a glass lens, and your focus is on light-weight all-day comfort, this could be the choice for you. You may have noticed a theme building with all the lenses being of the bronze, copper, or amber family. The 580G Green Mirrior is no different and sports a copper glass lens. They offer many different lens colors, but this one is designed for high contrast and with a VLT of 10% they are perfect for bright sunny days of sight casting. Costa made its name by designing what they claim the best polarized efficiency available. They filter out high-energy blue light (HEV) and block a spectrum of harsh yellow light which greatly enhances all the other colors. The added clarity and contrast that this technology provides cannot be more evident than when you are on the water looking for fish. All of this combined with the Green Mirror anti-reflective coating make these sunglasses the most popular choice amongst anglers. 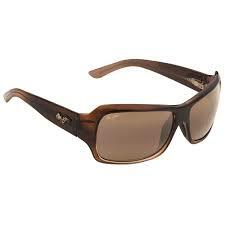 Sunglasses are one of the most important pieces of fishing gear needed for sight fishing. If your current sunglasses are a standard gray lens type and do not have any filtered polarization, you will miss half the fish you could have seen with one of the pairs listed above. They really do make an enormous difference in the ability to see fish. You will not regret spending the extra money on a good pair. After years of experience trying out different lens technologies and how those translate on the water, we feel these perform the best. You simply cannot go wrong with any of these choices.